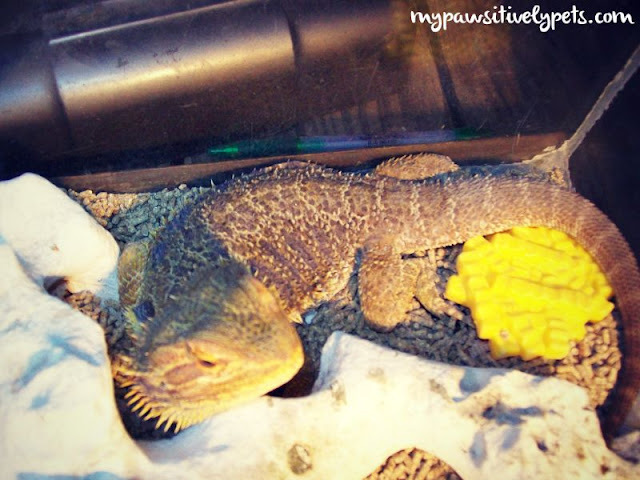 For the past few weeks, we've been sharing reptile care advice here on the blog. Although I do not currently keep a reptile as a pet, I've had them in the past and worked with a large variety of reptiles as a veterinary technician. The most recent and memorable reptile I've had was a Bearded Dragon. His name was Mr. Krunk (I can't take credit for the name) and he lived a very long life. Bearded Dragons get their names from the pouch-like skin folds under their necks that are covered in spiny projections and resemble a man's beard. My brother took Mr. Krunk in when a friend no longer wanted to keep him. He lived in my brother's college apartment, and he brought him home every weekend when he came to visit. He was a traveling lizard! Who says reptiles can't join in on the fun? After college, Mr. Krunk came to live with us full time as my brother moved back in to the house. He was easy to care for and my daughter loved him. Bearded Dragons make great pets for kids and first time reptile owners. He never offered to bite or hurt my daughter and she got to hold him on a regular basis. He didn't try to run away and would just sit with her. Some Bearded Dragons can actually recognize and respond to their owner's voice and touch. I know this was certainly the case with our Bearded Dragon. He sometimes would tilt his head (similar to the way a dog does) when we spoke to him. I helped care for Mr. Krunk a lot and enjoyed watching him during meal time. I liked giving him new foods to try, but I wish that I had done more research on his diet in his younger years. Yes, we fed him plenty of mealworms and crickets but the fruits and vegetables we fed him were mostly just things we thought he might like to eat. Over time, we learned what he did and didn't like to eat. 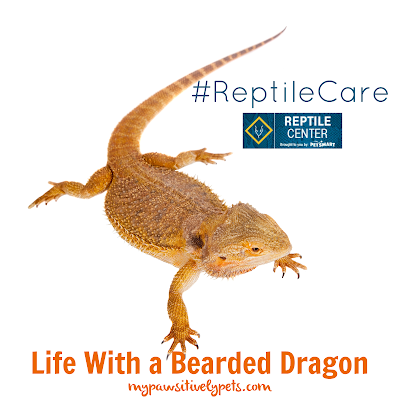 With resources available today like the PetMD® Reptile Center it is easy to find accurate and trusted information about Bearded Dragon diet and reptile care in general. 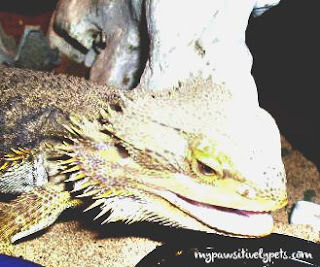 Diet is so important to a Bearded Dragon's overall health and well-being. After I started working as a veterinary technician for an expert reptile veterinarian, I learned SO much about reptile care. However, not everyone has this opportunity. I just can't stress enough how important it is to do your research before bringing a reptile pet home. The majority of Bearded Dragons and reptile pets that we saw at the veterinary hospital were sick due to poor care and/or husbandry. The PetMD Reptile Center has informational articles, videos, infographics, quizzes, and more to make sure you are ready for your new reptile. One thing I wish I had done differently with my Bearded Dragon was give him a different substrate. Substrate is the type of bedding you use for your reptile, and it is more important than you might think. We used sand as our substrate. However, as I began to learn more about reptile care I found out that sand may not be the best substrate for a Bearded Dragon. Sometimes, Bearded Dragons will ingest sand when they are eating their food and it will cause an intestinal blockage. It can and does happen, as I helped to treat a few Bearded Dragons who became sick from eating sand. Instead of using a substrate like sand, the veterinarian that I worked with recommended using a reptile carpet. This can be found easily at PetSmart®in stores or online along with all the other supplies you'll need to get you started on good reptile care. Being a reptile owner is definitely a lasting journey and learning process. I recommend doing some research, learning the basics about the species you want to keep, and then continue educating yourself as time goes on. I am still learning new things about reptiles and reptile care all the time. If you could keep any reptile as a pet, which one would you choose? They really are interesting looking and we think they would do just fine with us! I bet you guys would have a good time watching them. I love the thought of a bearded dragon or even an iguana for that. They are totally cool looking! However, I'm not sure how much maintenance they need but I'm thinking more than my 2 dogs. :) Thanks for sharing Ann! It's so hard to compare the two - lizards and dogs. Yes, they require maintenance but it's really simple once you know what that kind of maintenance is. I think once you get everything figured out, they can be pretty easy to for. I love our bearded dragon. He has so much personality. And he lets me dress him up in silly hats and take pictures. Baby bearded dragons are common in pet shops nowadays. This article explains how to care for a baby bearded dragon so that it grows up happy and healthy.